Think it was hot last summer? 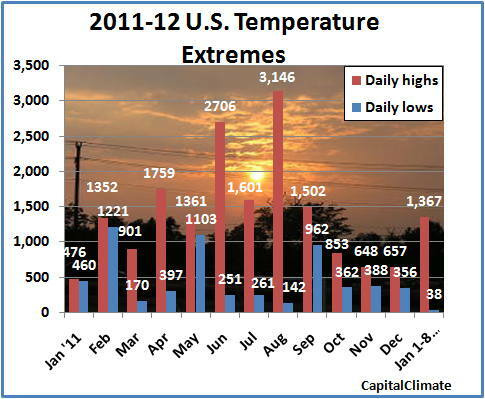 In relative terms, the first 8 days of 2012 have been even more scorching. The 1,367 new daily high temperature records set so far in January have been more than double the total number of cold records set in the entire summer of 2011. Compared to the amazing ratio of more than 11 to 1 for heat records vs. cold records in the summer, the ratio so far this month has been more than 3 times as high, at 36 to 1. In fact, there have been as many all-time January monthly high temperature records (38) as daily low temperature records. Although these were focused in the Dakotas, Nebraska, Minnesota, and Iowa, monthly records were also set in Montana, Oregon, Idaho, and Wyoming. The record setting high temperatures have been particularly intense in the northern Plains and upper Midwest, where many old records in century-plus climate histories were broken by double digits. As the map shows, however, records have been broken from coast to coast in most states except the extreme northeast and Florida. 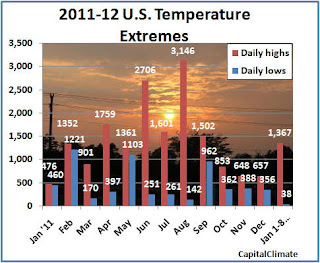 - Monthly total counts of daily high temperature and low temperature records set in the U.S. for January 2011 through December 2011 and January 1-8, 2012; CapitalClimate chart from NOAA/NCDC data, background image © Kevin Ambrose (www.weatherbook.com). Includes historical daily observations archived in NCDC's Cooperative Summary of the Day data set and preliminary reports from Cooperative Observers and First Order National Weather Service stations. All stations have a Period of Record of at least 30 years. - Locations of daily high temperature records broken (marked with "X") or tied, January 1-8, 2012, from NCDC.